#PHEDataWeek has been running across our social media channels this week. It has been a great opportunity for us to talk about what data means to us and try and help people understand just how important it is to our work. Data has been central to health and science long before computers and to be able to talk about it for its own sake has been huge fun for us, but also, in my opinion, part of our duty as public health professionals. When I was young I loved maps and atlases. I used to look at them for hours, learn capital cities and strange place names and consider it an afternoon well spent. It didn’t make much material difference to my life; except I grew up thinking the UK was much bigger than it really is. I wasn’t travelling anywhere. I didn’t go out of the British Isles until I was 21: atlases were just nice to have. So it is with all data generally, I find. We all love it - newspaper headlines, snippets on the radio - but data can go over our heads or worse, can be misleading, be misconstrued and misunderstood. Generally, data volume triumphs over new insight. Our role in Public Health England is I believe to counteract this. We somehow have to make sense of it and ask the awkward questions: What do we really need to find out? What viewpoints are we trying to counteract? Who do we need to take notice? How should we present this so people understand it? Who is likely to misunderstand and how can we help them understand better? What do we really want people to do? I am really lucky to work with colleagues who care and who are successfully creating new understanding leading to better outcomes, for example, earlier cancer diagnosis. In Julian Flowers blog he mentions “big data” and what it will mean. In essence it gives us the opportunity to produce data in industrial volumes in real time and the chance to answer new problems, but this means we will also need a slicker system to pan for nuggets from the vast knowledge stream. In theory we will be able to answer new questions, not just: “what has happened to health in the last 5 years” but also “what will happen in 5 years if we don’t do something quick?” Prevention is what public health is about, so this really could be a major milestone. We now have opportunities that give us a chance for a better balance between retrospective and prospective analysis, using techniques like modelling, using “big data” and using real-time evaluations of new interventions, so we don’t have to wait years for a randomised controlled trial or systematic review (even though sometimes, you really do need them). Finally, will ever more, and more powerful data, we need to think even more about how to help people understand the conclusions we draw. It often seems to go horribly wrong; communication is a complex business. Especially in health, where there is so much background ‘noise’. For example, the recent World Cancer Research Fund report on red meat consumption may have achieved big headlines but the (well established – the report was nothing new) data and facts were lost in hyperbole and a confusing debate around definitions. As such, I’d be surprised if it changed much behaviour. Good data was lost to confusion and the agendas of different voices. Part of the reason we are running this week on social media, is to help explain the data landscape better, to avoid this kind of confusion. So in conclusion, we have a fantastic opportunity to analyse where no one has boldly analysed before, and add understanding to our world. But to have an effect, we will need to build on our many successes to find truths from complexity of data, present it in an unambiguous way and explicitly counteract those perceptions which are not based on the facts. 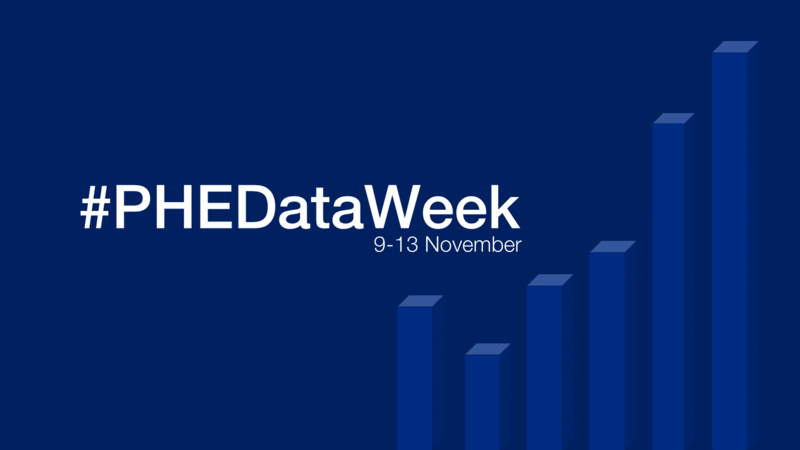 We hope that activity like #PHEDataWeek helps people understand things better and in future, get to the facts (and the data) behind the headlines.